Google today said its personalized feed will begin to appear in the Google mobile app for Android and iOS devices. The feed, which Google has been testing on Android since late last year, displays information cards below the search bar based on each user's individual search history. Google will also toss in information concerning trending topics both local and global. The more people take advantage of the feed, the more in-tuned it will become to individual tastes and interests. The new feed supplants Google Now, which delivered articles and information cards. The cards generated by Google Now will still appear, but fall under a new "updates" tab in the Google app. 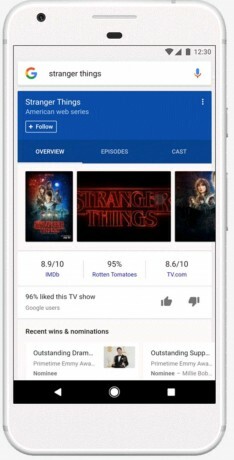 A new "follow" button has been added to search results so people can follow topics or interests (sports teams, artists, movies, TV shows, celebrities) more directly from their daily interactions with Google. News stories will be presented from a variety of viewpoints and Google says simple fact checking tools will be available to help combat inaccurate sources. Moreover, people will be able to dive deeper into their favorite topics via dedicated search tools. On the flip side, Google suggests that it will be easy to unfollow topics presented by the feed so they don't reappear. The Google app with the new fees is being updated for Android and iOS in the U.S. today, and will roll out globally over the next few weeks. Facebook updated several of its offerings today, including how it handles trending news and supports fundraising campaigns. Facebook says it has redesigned its trending news function with the goal of surfacing higher-quality content in the news box.